Join the discussion on our forums! 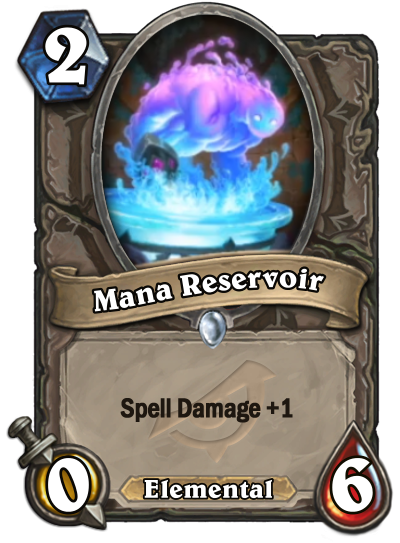 Come discuss Mana Reservoir over in our dedicated Mana Reservoir discussion topic. If it soaks too long, it becomes a reservoir hog. Only useful when you summon it from Vex Crow or from Lackey. I mean, the 0/7 spell damage imp, while a demon, which sadly rarely was relevant, was disadvantaged by being a 3 cost one, but this at 2 and still having 6 health, and elemental tag to boot, well, it just might be able to make some notable placements in decks. in my opinion this is the best spell damage minion outside of thal'nos, cat, and drake. twisted zealot was a close second that almost saw play in frozeny dudes expansion. The definitive Bloodmage Thalnos budget substitute.